The new 2012 and 2013 engines incorporate DEUTZ's new DCR® common rail fuel system, which imposes more challenging performance requirements on the low-pressure, belt-driven fuel pump. 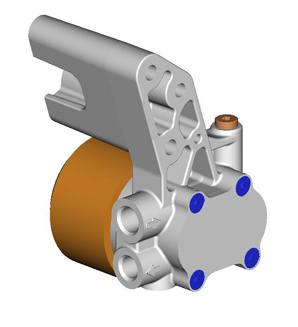 Concentric has responded to this challenge by replacing the previous rotor pump with a gear pump design. The new pumps, which feature robust cast-iron housings, have demonstrated improved performance and durability. The Deutz 2012 engine is available as either a four or six cylinder in-line engine, with a power range of 60 to 155 kW and is designed for construction, stationary, agricultural, mining and other equipments as well. The 2013 is a compact four and six cylinder in-line engine, with a power range of 85 to 200 kW designed for the same application like the 2012 series. Both offer turbocharging or turbocharging with charged air cooling.